I have known since 2017 that this set has been forged just like all the other stamp sets I have written about. As the images above show these forgeries exist in perforated and imperforate forms. 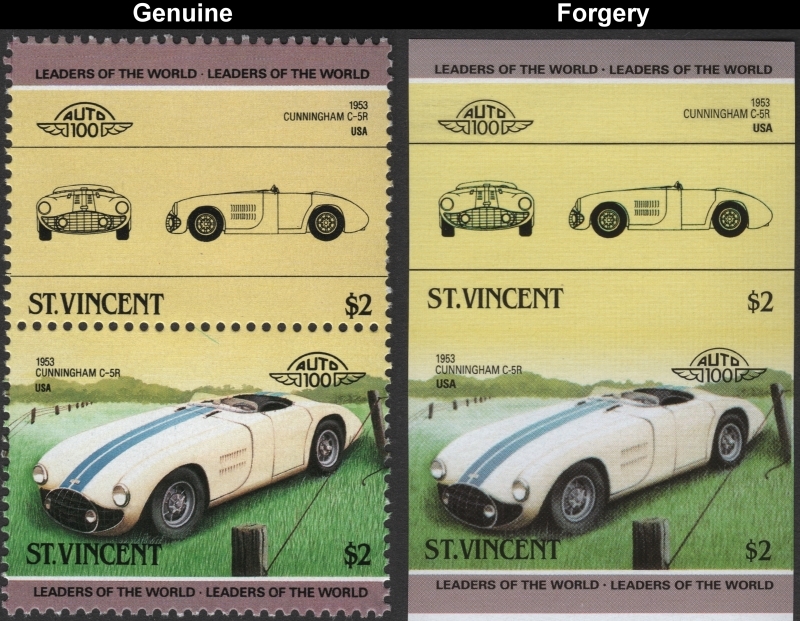 This forgery set is easy to recognize just by the color of the 55c Pontiac Firebird Stamp. The background sky color is so extremely different than the genuine stamps that it is easy to tell just by the images given by any sellers no matter how small or "enhanced" they may try to do to the image. 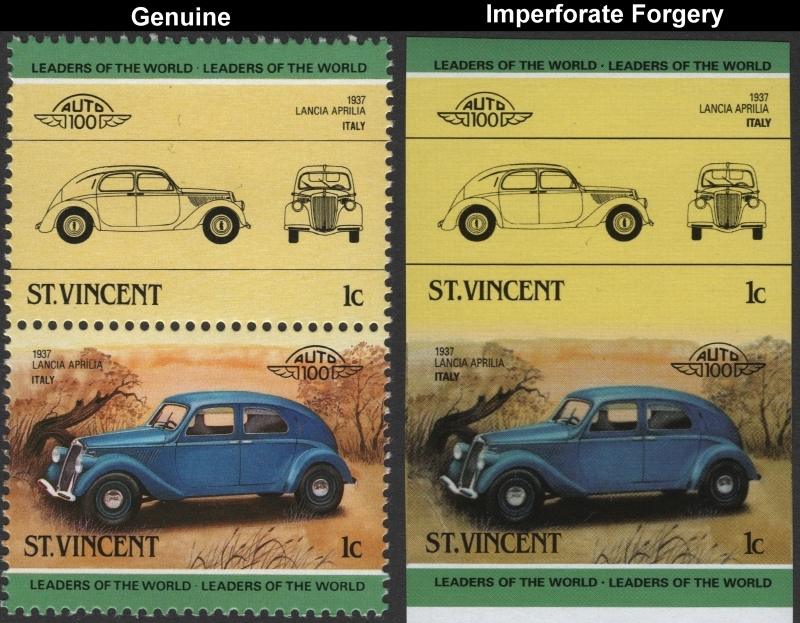 The genuine stamp has a bright turquoise blue sky whereas the forgery has a dull lavender-blue sky. I have not found hardly any of the perforated version of these forgeries offered on eBay and other venues whereas many genuine sets are offered. I have found numerous cases of the imperforate forgeries offered mainly on Delcampe. That is where I got the above imaged imperforate forgery set. I have recently discovered that modern fake stamps of this issue are being flooded onto the market. I can tell you that real dangerous	fakes or some call forgeries are being flooded on the market as I write this page in February of 2018. My research into the printer has enabled me to discover modern fake stamps have been created in 2014!! They are being spread across the world through online auction sites like ebay and Delcampe. Everything about them is fake except for one dangerous fact, they have the correct perf size. The gum type is different in it being white in color and very shiny. This gum type was not used until much later years, long after Format went bankrupt thus proving they were not produced by the Format International Security Printers. Obvious differences will be shown below. 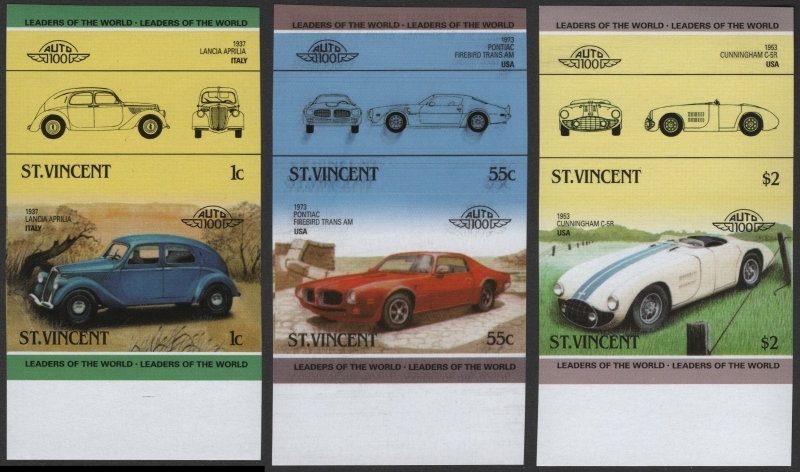 So far I have discovered complete sets of forgeries of the Saint Vincent Leaders of the World 1985 Automobiles 3rd Series issues. All are being offered online right now as I write this on. As I said earlier I received the imperforate set from a seller on Delcampe. I purchased the genuine set from a reputable seller on eBay. I found the imperforate forgery set has the yellowish gum. 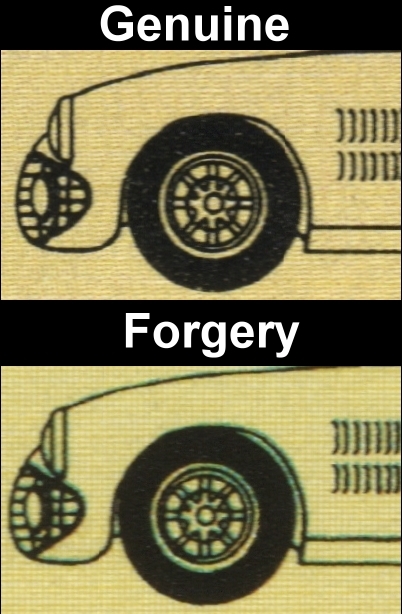 It is possible and probable that the imaged forgery set that has been offered by user asrm10 on eBay has the white gum I describe in many of the other pages. 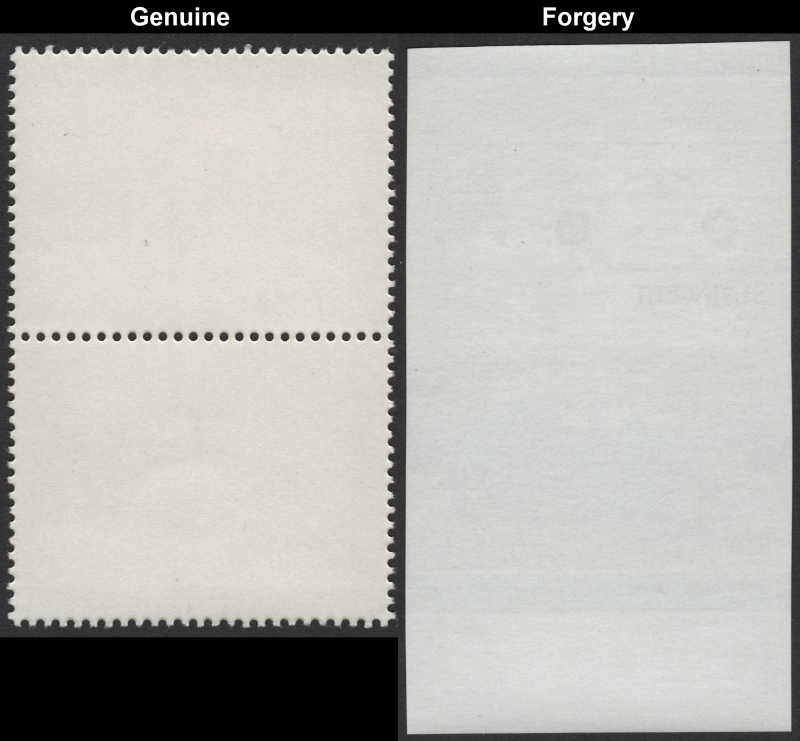 Here is resized image of the perforated and imperforate fake gum with an original. Note the opacity of the forgery gum. You can see the tires in the detail drawing easily. 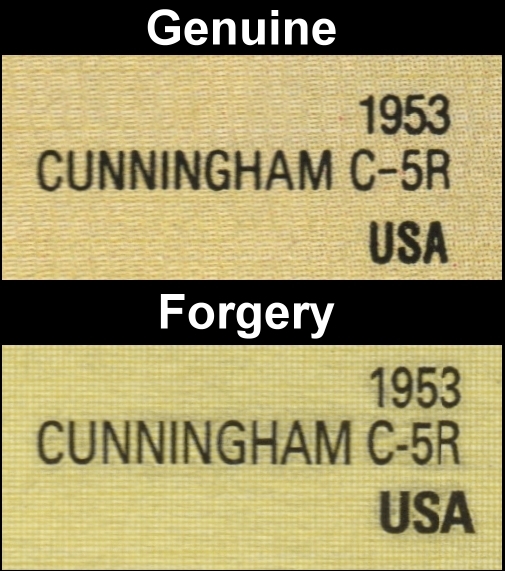 Let us use the $2 1953 Cunningham automobile stamp for high resolution comparisons. I use 1200dpi scans for viewing. This first comparison shows you how inferior the screens are. I compare the front of the car. Look at the "dash" between the "C-5R". Completely different. Look at the position of the "USA". It is positioned to the right making the "A" stand further to the right than the letters above it. 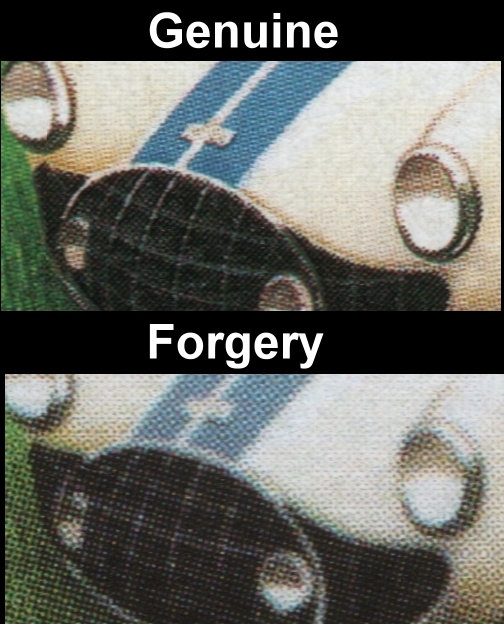 On the forgery it is positioned left making the "A" further left than the letters above it. You can see other differences as well. Now let's look at the Front of the car on the detail drawing. The details are much the same except for the smearing of the ink on the forgery. The background color is tan-yellow on genuine stamps. It is dull mustard yellow on the forgeries. The tree stump and all the trees and sky are shades of red-brown on genuine stamps. Shades of gray-brown on the forgeries. The dot between the "Leaders of the world" logos is very small and indistinct on genuine stamps. It is bigger and is pronounced on the forgeries. The "Y" of "ITALY" on the detail drawing stamp is to the right of the letters above it on genuine stamps. On the forgeries it is almost "inline". Here you can see the extreme differences clearly. Obviously the color of the background. Turquoise blue on genuine stamps. Lavender blue on the forgeries. 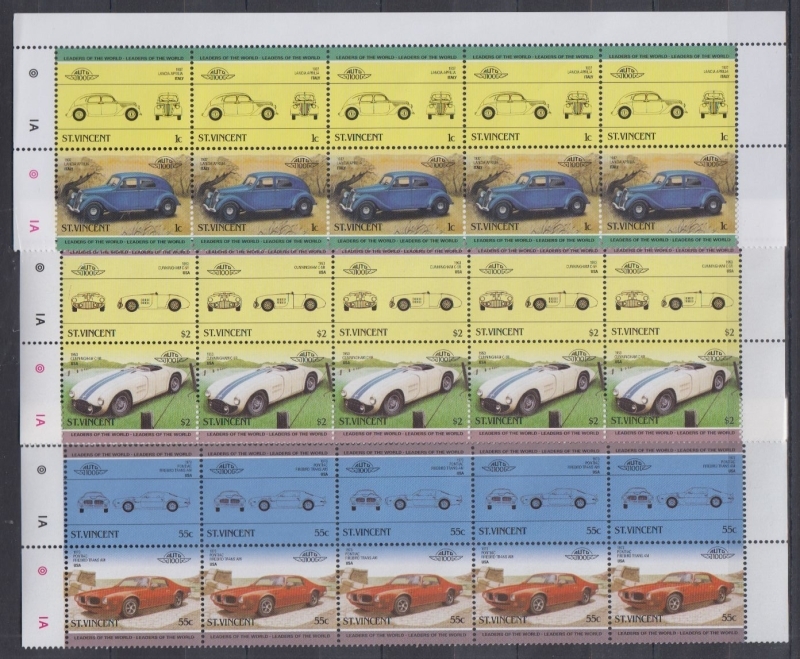 Upper and lower color bars are gray on genuine stamps. Brown on the forgeries. The car is bright red on genuine stamps. Dull red on the forgeries. You may notice the "double printing" of the black on the forgery. Not all the imperforates have this nor do the perforated versions of the forgeries. 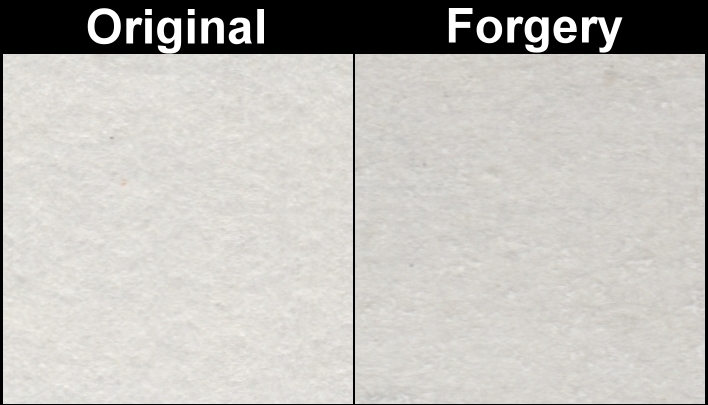 It is possible the forger was attempting to create an "error" for more profits. That will not happen. None exist except on these forgeries. Obviously the color of the background. dull gold-yellow on genuine stamps. Light yellow on the forgeries. Upper and lower color bars are red-mauve on genuine stamps. Gray-mauve on the forgeries. The car a yellowish tint on genuine stamps. You can hardly see it on the side of the car and none on the hood of the car on the forgeries. The grass is green on the genuine stamps. Yellow-green on the forgeries. The dash between "C-5R" is long on the genuine stamps. It is short on the forgeries. Indeed several issues that I have researched and obtained the original varieties of are effected. This issue does not effect me at all. I am a professional tradesman and have never depended on stamps to live on. There are many that do depend on stamp sales though and it is for them also that I have created this section of the website. 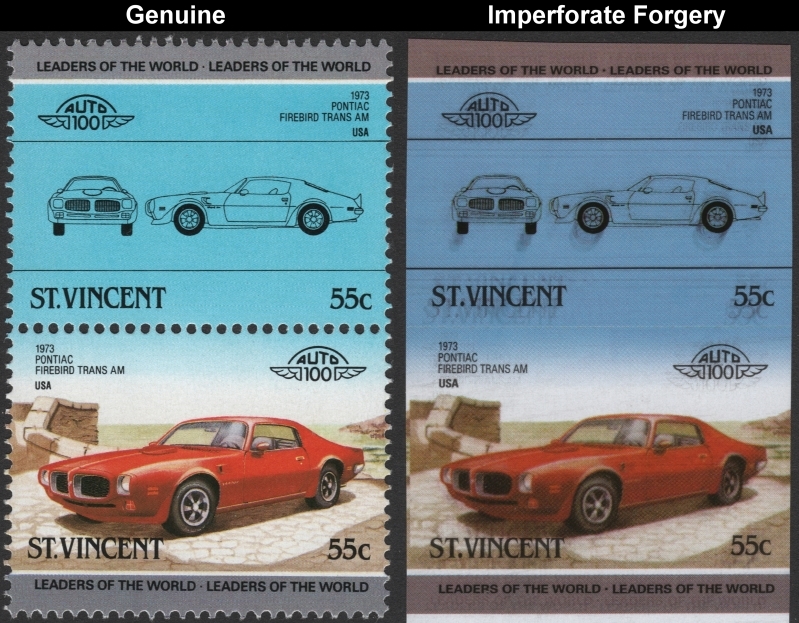 You can now define the Saint Vincent 1985 3rd series Automobiles stamp forgeries easily and can now possibly avoid being ripped off! Sorry to say this, a lot of you already have been fooled and more of you will be until the right people get serious about it!